ChildFund works to assist children and their communities in some of the most challenging environments on earth. Flavia works for a ChildFund partner organisation in Dominica. 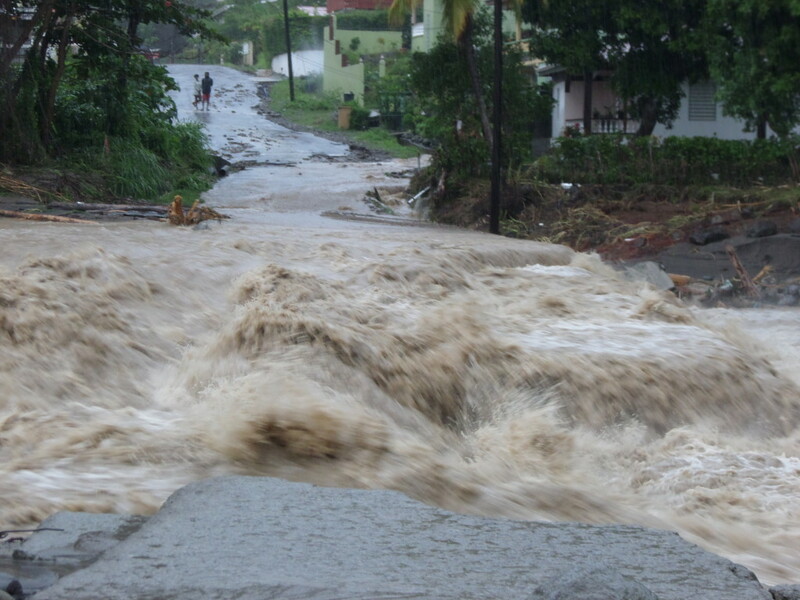 Her village was recently hit by terrifying flash-floods in the wake of Tropical Storm Erika. 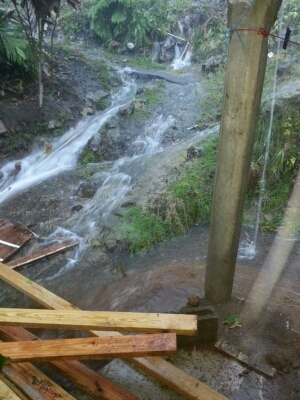 This is her vivid account of what happened..
Damage caused by terrifying flash-floods in Boetica, Dominica…in the wake of Tropical Storm Erika. Flavia Lanuedoc works as a sponsor relations officer for one of ChildFund’s local partner organizations in Dominica. She lives in Boetica, a village that was cut off from help after flooding from Tropical Storm Erika in late August. Despite spending her whole life in the area, Flavia had never seen anything approaching a disaster of this magnitude. Here, she recounts the terror and drama of the flash floods , the difficulties it has has created from her friends and neighbours, and the solutions they have come up with to overcome these problems. The early hours of Aug. 27 had brought with it torrential rains, so I peeped outside to survey what damage had been done. To my disbelief, the yard of the house where I had lived all my life had turned into a raging river. As I turned from the window, I saw that water and mud were rushing in through the other door. I screamed and ran to wake up my children. Within a split second, water was gushing into the house, bringing with it thick mud. It soon became obvious that our efforts to prevent the water from entering were futile. We gave up, and our focus now turned to saving the items that were at floor level. Soon, seven men barged into our yard. Every community has “village champions” who carry out search-and-rescue efforts, even if they have little or no training. These men were bearing news of hope as well as horror. Their tidings still resonate as if it was yesterday: “Give thanks, all of you. Say praises to the Lord, because if that road in the corner did not break, all of you would be dead.” And without even pausing, they entered the house and began assisting us. 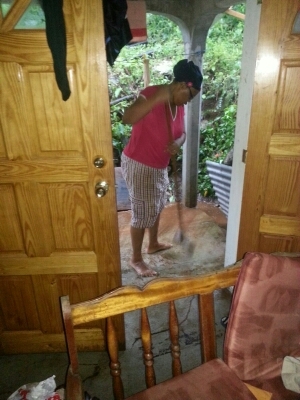 It took all of us over an hour to clear the mud from inside the house and then pour buckets of water to clean it off. They quickly moved on in search of another family in trouble. After the rain ceased, it was time to survey the village. I was amazed at the devastation. We were blocked from the nearby village of Delices, on the southern end, and the main bridge on the northern end linking us to the rest of the island was gone. There was rubble and debris all over. We were trapped in the village without water, electricity and means of communication. Dominica has been identified as the island in the Caribbean with the highest number of cell phones per capita, but that meant little for our village and our ability to reach the outside world at a time when it mattered most. Going from one village to another was dangerous, as one had to go through huge mudslides, boulders and rocks. Before long, a villager discovered one little spot with cell reception, and it became the meeting place where villagers would gather to contact their loved ones and transact business via phone. Those from the neighbouring village who were cut off by a landslide braved the dangerous journey to that little spot to communicate with the outside world as well. With no electricity in the village, it was hard to keep phones charged. But as luck would have it, a shopkeeper had a small generator, so villagers were able to recharge their cell phones there. Meanwhile, the owner of the village shop had to begin rationing his stock to ensure that everyone was able to have some food and drinking water. The days that followed were hard on my children. My 17-year-old son refused to sleep in the bedroom and chose rather to sleep on a chair so he could keep an eye on the door to see if water was again coming in. Having filled some of the most basic needs, village leaders soon decided that we needed an emergency route in case someone needed to be taken out of the village for medical reasons. More than 50 years ago, people had built a path across a 250-foot gorge with rocks and dirt, connecting Boetica and Laplaine. Now, it needed to be tackled and tamed once more. 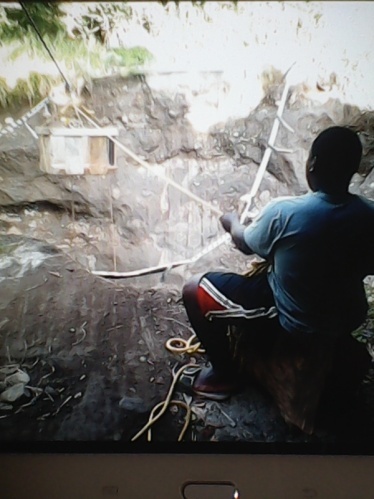 Villagers placed a rope over one side of the cliff, then scaled the cliff and climbed up the other side. During the next few days, helicopters brought in much-needed supplies, and we decided at a meeting that we needed to get the sick and elderly out. 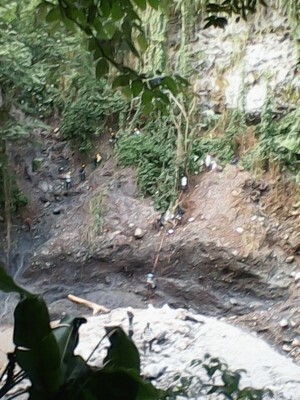 Eight people were airlifted, and soon, children and youth who attended school and college in town were airlifted too. Fire-fighters helped us bring in supplies with a pulley over the gorge once helicopters were no longer available. A century-old villager died, and his coffin was pulled across the gorge to its resting place. Electricity returned almost two weeks after the storm, so I was able to receive and send emails. I visited several of the ChildFund-enrolled children’s families in Delices (though the road remained dangerous, especially when wet), helped in village clean-ups, distributed relief supplies and assisted in any other way I could. Getting out of the northern section of Boetica to the rest of the island is no easy feat; neither is it for the weak nor faint-hearted. I dared not climb the ladder or crawl down a cliff using a rope, and I didn’t walk along cliff edges or on the deserted beach, either. However, with families to serve and community mobilizers to support, my task would have been impossible without the village heroes. I am able to function effectively as a sponsor relations officer (despite being cut off) because villagers climb the ladder and ropes and help me carry letters and other documents from the area offices to ChildFund Caribbean’s national office. Thanks also to the staff members who supported me in so many ways. My experience is overwhelming evidence that the local people are the first responders. They have the skills and experience of traversing this terrain and, most importantly, the resolve to create the means of survival in times of disaster.